I was 14 years old before I ever set foot into a Toys R Us. Before then, the closest I ever came was passing the multi-colored sign on the expressway on the way to Kennedy Airport. Now, that's not to say I was never taken to a toy store. There were a few mom and pop independent toy stores in Queens back in the 1980's that I distinctly remember going to during the holiday season, or during the summer for bicycle purposes. But nothing in the scale of a Toys R Us. Geoffrey used to lure me with his siren song on Saturday mornings, with the promise of staying young forever if only I would be a Toys R Us kid. I so wanted to be one. The other children on my block would tell the fantastical tales of venturing into the den of all that was holy to a child. Toys stacked from floor to ceiling! Every toy imaginable was there, even stuff that was never advertised on TV. This sort of place could not really exist, could it? But it had to. I had first hand eye witness accounts. I myself had seen the very building that housed this wonderful place from the dirty backseat window of my dad's Ford Maverick. At times, I would ask to go there, just to see it with my own eyes, however the answer was always no. There was no reason to go there according to my parents. Alexander's had a small toy section, and we could go *there* if I wanted, since that would allow my mom to buy my dad some pants. Or I could go with my dad to Tru Value and look at their toys while he bought a hammer or something. Maybe if I was lucky, we could go to Odd Lots, home of the Isle of Misfit toys, where not only I could look, I might be able to go home with something... if there was money left over after my mom bought me my school supplies. There was never a reason to go to Toys R Us. 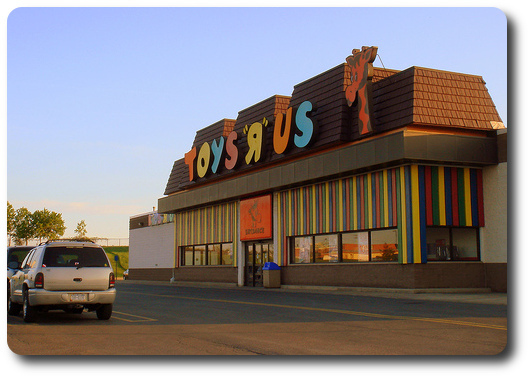 I still never grew up, despite I never being a Toys R Us Kid.